With more than 50 people in attendance, the annual Hot Rods 'N Heat car show and chili cook off raised $225 to go towards a Mulvane Career and Technical Education Scholarship. Ten vehicles were entered in the car show, six of which were brought by the Mulvane Marauder’s Car Club. The Mulvane Marauders Car Club got involved with Hot Rods 'N Heat several years ago and always enjoy coming back. Julia Jarboe, Mulvane Center administrative assistant, said the goal of the event is to raise awareness of what programs Cowley College offers at the Mulvane Career and Technical Education Center while raising money for a CTE Scholarship. Justin Reynolds was named the winner of the car show, while Octavio Matamoros won the chili cook off. 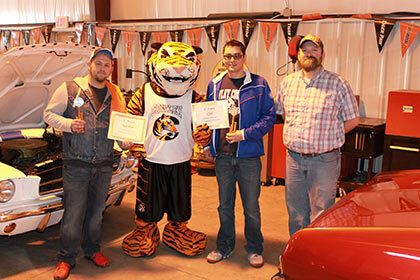 Pictured, from left, Justin Reynolds, Tank the Tiger, Octavio Matamoros, and NDT-Lead Instructor Joe Clasen.